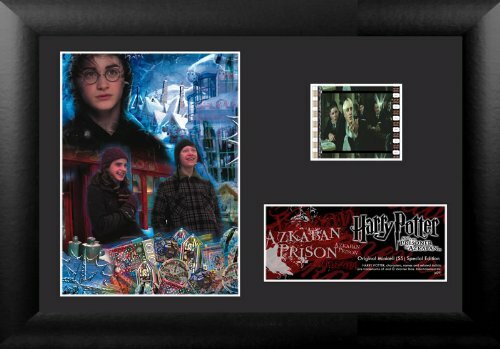 This framed film cell presentation features a cell of hand selected original 35mm film from the movie Harry Potter and the Prisoner of Azkaban. The film cell is mounted with mini posters/photos from the movie and a nameplate engraved with the title and limited edition number. They are set on an acid free, double matted mounting board and framed in a beautiful black ash effect frame. This highly collectible film cell presentation is limited in number and comes with a certificate guaranteeing the authenticity of the cells. The image shown of the presentation is an example of what the film cells will look like. Please note that every set is unique as they are hand picked from the original film.